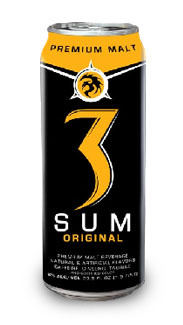 3SUM is marketed as a premium malt beverage "infused" with the energy components caffeine, ginseng, and taurine. The flavored beer is produced by United Brands Company in La Mesa, California and is promoted in nightclubs and bars across the U.S. and Europe. 3SUM is considered a flavored energy drink and a beer and is available in 4 different flavors: original, apple, tropical, and watermelon. According to the producers, "the power of a 3SUM will arouse you, and the perfectly balanced taste will keep you coming back for more".